Amelia is a true all-rounder, with great stats in all areas save for Resistance. Her key stats are Attack and Speed, which help her to hit harder and win more Speed matchups. Physical defense is important to her in order to survive Bold Fighter initiations, while her Resistance helps her to survive against dragons and mages. Amelia hates a flaw in any stat, so it’s highly recommended to go for at least one merge when using her. +ATK: Amelia is by no means weak, but falls a little behind other armored units. An Attack asset goes a long way to boosting her KO power. +SPD: Speed is a very important stat for Amelia, largely due to her proficiency with Special Fighter. A Speed asset is her second best choice, but can be overkill depending on what buffs she is receiving. DEF: Because Amelia can’t stop armor with Bold Fighter from getting follow-up attacks when initiating, she needs all the Defense she can get. Better defense also boosts the power of Bonfire and Ignis, her most common Special choices. HP: This is an important stat due to affecting Amelia’s overall bulk. She isn’t hurt too badly by a flaw in HP, but it’s not ideal. -RES: Amelia’s high HP means she is hard to KO, and mages who could possibly defeat her with two attacks will be destroyed by Amelia’s retaliation. Although Resistance helps her a lot when facing dragons, it is ultimately her least impactful stat. Armor are known for their mixed phase prowess, often through a combination of Bold Fighter and Quick Riposte. However, these builds are often weighed heavily towards offense or defense (such is the case with Hector and (LA)Hector). Amelia is a different kind of unit, instead leveraging her Speed to secure follow-ups and allowing her to make use of Special Fighter. This set gives Amelia well-placed boosts and allows her to duel almost any other unit, while circumventing some of the typical armored unit weaknesses. Her core skill is Special Fighter, which is a three-in-one skill which grants her a combination of Guard, Steady Breath, and Heavy Blade. It allows Amelia to charge her Specials quickly while denying them to her opponent, and is the most important skill within this build. Because Special Fighter does not guarantee follow-up attacks like Bold Fighter, Amelia needs Speed to help her win duels. Grado Poleax’s refine helps with this, as Atk/Spd Bond, which combine to grant Amelia an extra 10 Speed and some valuable Attack and Defense. Distant Counter is irreplaceable due to its unique effect, but a budget choice like Fury is her next best choice (She’ll need to manually retaliate against ranged attackers, though). Blue Flame just edges out Bonfire for damage, but both are excellent choices for Amelia. She also has the option of running Ignis alongside Quickened Pulse, but this may leave her lacking in the Speed department and weaken her offensive power slightly overall. Reposition and Swap are great movement tools, and are especially good if Amelia is being run as a part of an armor team. Hone Armor and Armor March are her best C slot skills, each giving her armored allies a different kind of boost. If using Amelia on a mixed squad, a Tactic skill is a better choice for her. Because her Grado Poleax has a slaying effect and comes with bonus Speed, it makes Amelia a great candidate for a Galeforce build. Although gimmicky, this set is a lot of fun and is sure to surprise opponents in the Arena and Aether Raids. Unlike most Galeforce users, Amelia does not need to attack twice to trigger it: Because of Special Fighter, she only needs to hit once (and be hit once) to activate her Special. This means that although she is one of the fastest units, she is less reliant on Speed than other Galeforce users. With her Grado Poleax in hand, Amelia only needs four charges to activate Galeforce. And thanks to Special Fighter, she can get the job done with just two hits. If Special Fighter can’t be obtained, Chill Def (with Flashing Blade in her seal slot) is a great alternative. Atk/Spd Solo is recommended for the biggest boost to her offensive stats. Fury, Life and Death, and Swift Sparrow are all decent alternatives that bolster her Attack and Speed. The Darting Blow seal is a great choice, but one might find the extra Speed unnecessary: A support ability such as Even Def Wave or Def Tactic works wonders in its stead. Armor March is required here to help Amelia get around, and it’s highly recommended she opts for either Swap or Pivot to get herself into the action faster. Hailing from Sacred Stones, Amelia is a young girl from Grado who joins the war effort as a recruit. She had many promotion paths in her main game, and her appearance in Fire Emblem Heroes is inspired by her promotion to a General. 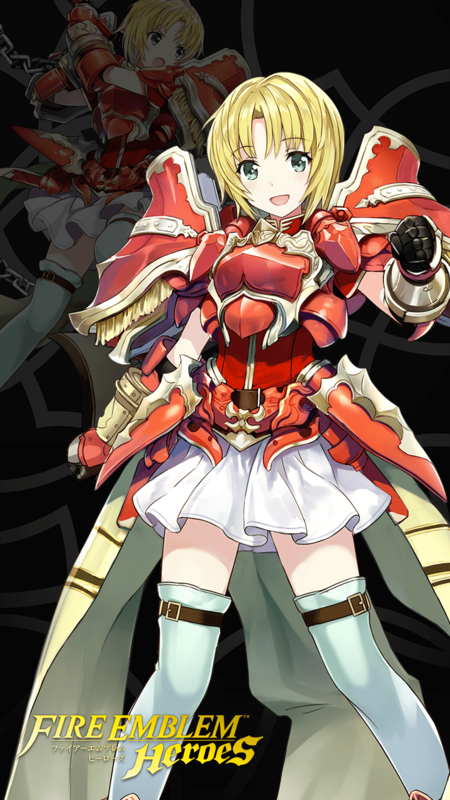 She’s an armored unit who wields axes, and is best known for her all-rounder statline that excels in Speed and Defense. Amelia is great in general, having a well-rounded statline that sees her excel in all but Resistance. She is among the best Special Fighter users in the game and is an oddity amongst green armor, who often has very low Speed. Compared to Brave Ephraim, she has lower Attack and has a harder time handling opponents that use Wary Fighter. In return she is much stronger defensively, mostly due to her high Speed. She stands as one of the most balanced units in the game, and thus, has very little in the way of weaknesses. Her low Resistance can be exploited by mages, although they have difficulty OHKO’ing Amelia. Lack of Bold Fighter and Quick Riposte mean she is more susceptible to skills such as Wary Fighter and Axebreaker that control follow-up attacks. Amelia has incredible stats across the board, especially in Speed and Defense. 34 base Speed makes her one of the fastest armored units, and the boost from her Grado Poleax raises it to 39. This also gives Amelia an effective 40 base Defense, making her difficult to KO and letting her fire off insanely strong Bonfire and Ignis Specials. Having an effective 39 base Speed makes Amelia one of the best users of Special Fighter. While most armored units must rely on Bold Fighter and Quick Riposte to get follow-up attacks, Amelia can simply rely on her Speed. This frees up her seal slot and gives her the effects of Guard, making it very for opponents to KO Amelia. Amelia is one of the game’s few true all-rounders, being very strong on both phases and only having one HP conditional. While Bold Fighter users tend to lean toward offense and Wrath users lean toward defense, Amelia has balanced power in both phases due to her high Speed and defensive stats. Special Fighter also starts activated and has a very generous HP range. Amelia’s statline only leaves her Resistance wanting. At base 23 it is lower than most armored units, and means she’ll take heavy damage from magical attacks. She is susceptible to Ploy skill debuffs and dragons with Bold Fighter. Mages with an extreme amount of attack or use Infantry Pulse can OHKO Amelia. Because most slower armors use Bold Fighter and Quick Riposte, they can guarantee follow-up attacks which Amelia can’t. This means they’re better at punching through units like Myrrh and Legendary Hector, who force Amelia to a stalemate. Although rare, Axebreaker can be a problem for Amelia if she fails to OHKO with Bonfire upon retaliation. Amelia is right at home in a team of armored units. They can help give her the coveted Hone Armor buff, as well as Armor March to help out her offenses. Amelia can also work on a mixed team, but as is the case with most armor, will likely need some movement support to get around. Ultimately, Amelia does not strictly require any kind of support, but appreciates buffs the same as most units. Armor: They are easily her best choice of teammate due to their ability to provide Hone Armor. Amelia gains more than most from Hone Armor due to the Speed buff. Armor March is also very useful, and can be given by Amelia herself. Examples include Zelgius, Black Knight, Arden, Brave Hector, Winter Ephraim, Effie, and Hardin. Movement boosters: Refreshers and fliers can give Amelia greatly increased movement through their abilities. Guidance is available as a seal and can be given cheaply to any flier. Olivia, Legendary Azura, (NY)Azura, Bridal Ninian, and Tana are examples. Resistance tanks: Tanks built around high resistance make a great pairing with Amelia, helping her to handle magical foes. Some of these units have low Defense, meaning Amelia can contribute her own abilities in turn. Julia, Deirdre, Felicia, Niles, Kaze, and Sigurd. The list of true counters to Amelia is very small, due to her Speed, bulk and ability to deny enemy Specials with Special Fighter. Although she is bulky, she has no way to prevent being OHKO’d. Armor-effective weaponry, Infantry Pulse mages, and units that can wear her down from a distance are threats. Anti-armor: Amazingly, Amelia can prevail over some slower anti-armor units. But ones with Triangle Adept or Axebreaker will crush her. Examples include Bartre, Olivia, Selena, Draug, and (HF)Micaiah. Infantry Pulse mages: Amelia has a respectable combined magic bulk of 73 (with a refine on her personal weapon). While that is often enough to prevent immediate OHKO’s, users of Infantry Pulse can pre-charge Specials to score an easy OHKO. Some mages can get the KO without raw buffs alone. Examples include Ophelia, Lewyn, Julia, Sonya, Merric, Lilina, Bridal Tharja, and Sanaki. Wrathful Dazzling Staff users: Because they prevent Amelia from counterattacking, they can chip her down significantly without her retaliating. Although they can’t secure the KO, they can easily render Amelia a non-threat. Brave Veronica, Azama, Maribelle, Lissa, Elise, Genny, and Bridal Lyn are examples. Grado Poleaxe's unique refinement makes Amelia very fast and physically tanky, enough to let her run Special fighter 3 and deal insane amounts of damage with bonfire with Atk/Def Bond 3 seal and some extra support buffs from her team. I decided to make my Amelia a fighting medic (with her spd the way it is now she has a really high chance of doubling her enemies, making her the fastest armored unit on my team). My current summoner support unit. Sacrificed the likes of Hector and Brave Ephraim to make this absolute monster. Charges Aether in a single turn With Special Fighter and Slaying Axe. An added Distant Defense still makes her almost impossible to kill. +1 Merged. The Wall. Bit of a simple build for Amelia. This build is all about her def. Now I know a def bane is probably the worst thing imaginable on her, but I think I've salvaged her. Steady Stance is basically a more budget Steady Breath. While SB would be better, I feel like SS synergizes a lot better with VF imo. Because, it's basically the Earth Boost effect except it activates in combat, so being able the counter two times while the defense boost happens really helps. And there's no replacing Armor March tbo. It's way too useful. Slaying AxeAccelerates Special trigger (cooldown count-1). Earth Boost 1If unit has at least 3 more HP than enemy at the start of combat, unit receives Def+2 during combat. Earth Boost 2If unit has at least 3 more HP than enemy at the start of combat, unit receives Def+4 during combat. Earth Boost 3If unit has at least 3 more HP than enemy at the start of combat, unit receives def+6 during combat.